Chirar Polau / Fried Flat Rice is a simple handy recipe which you can modify as your taste bud. 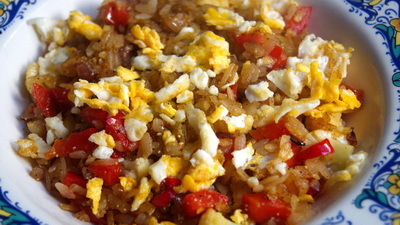 Chirar Polau / Fried Flat Rice is usually made as a vegetarian dish but I like to use egg to make a complete food. You can use peanut instate of egg to make it vegetarian dish. Even you can use your choice vegetables for this recipe. 1. Wash the flat rice and soak in water 15 minutes. Strain it and keep aside. 2. Heat the pan with 1 teaspoon oil and make scramble egg with pinch of salt. Keep aside the scramble egg. 3. 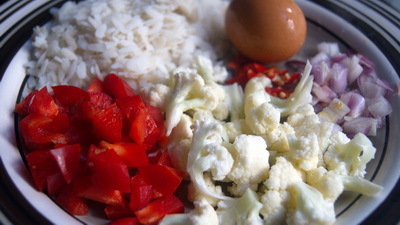 In same pan add 1 teaspoon oil and fry the cauliflower floret and salt till it becomes tender. Keep it aside. 4. In same pan rest of oil and add poppy seeds when it starts crackle, add onion. 5. Fry onion 1 minute and add capsicum. Fry it 2 minutes and flat rice, black pepper, cardamom powder and salt. 6. Fry it for 1 minute then add cauliflower, scramble egg and sugar. 7. Saute it about 1 minute and remove for heat. 8. Serve Chirar Polau / Fried Flat Rice hot. Hi Rownak thank you very much for Chirar polau recepi, it came out great! By the way I haven’t received any new recepi from you for a while, am I still on your mailing list? Please put me back again.Stay well, love you! Love you too Tanjila. Hope you already know the reason behind my absence. Thanks for your love.